Do You Really Know What to Do With Those Falling Leaves? Every year my kids and I collect beautiful fall leaves. They usually sit in a pile until they dry out and crinkle apart into leaf dust on my table. 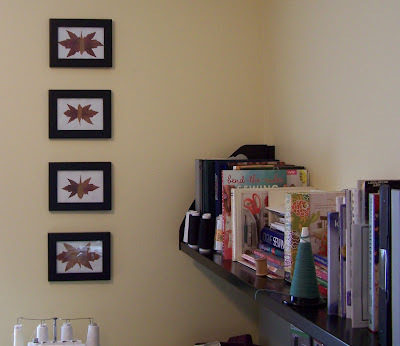 Inspired by Martha Stewart, we created these framed Pressed-Leaf Butterflies and hung them in our craft room. 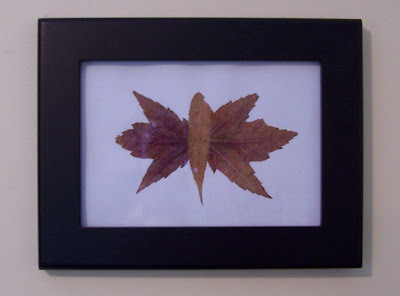 Martha’s website also has instructions for a Leaf Decoupage Picture Mat which looks really nice. Every Thanksgiving, Christmas and Easter, Annie and I make crafts for all the ladies of the family (Grandmas, Aunts and out-of-college-cousins (sometimes)). One year we made the acorn frames. We also made the acorn mirror and gave that to one aunt. The process is simple. 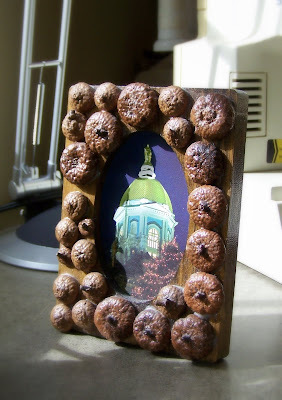 We select a wooden frame from JoAnns, stain it, glue the acorn caps on and decoupage. PS, from yesterday’s post: This is a shoutout to another blog I write with the owner of Contemporary Cloth. She is hosting a giveaway for a free yard of fabric. The giveaway is here. You can check out my newest apron in Piccadilly fabric here! Thanks Jane! Love those acorn frames…out to hunt for some tommorow! I love fall crafts. I think yours are absolutely fabulous! Hi Jane! Thanks for stopping by my blog and leaving a comment. The pressed leaves are so pretty and look great hanging in your craft room. I like the acorn frames, too. What a crafty lady you are! 😉 I love the picture frame- I think I just might try that out myself! Wow the pressed leaf butterflies look beautiful, what a great idea! Very creative and eco eco, Jane! Love the idea.